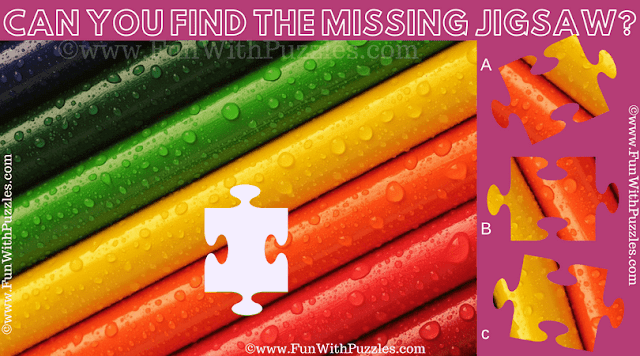 This Missing Piece Jigsaw Puzzle is very interesting Picture Game which will test your observation skills. This Jigsaw Puzzle Game is also a Missing Piece Jigsaw Puzzle for the people who has very good observation power. This Missing Piece Jigsaw Puzzle is to test your visual skills. Lets see if you can find the missing piece correct in this Puzzle Picture? Answer of this "Jigsaw Puzzle Game for Adults", can be viewed by clicking on button. Please do give your best try before looking at the answer. This Jigsaw Puzzle was to test your mental visual ability. Do checkout our brain games and mind teasing puzzles to challenge to brain. 1. Elevate Mobile Games: If you like to play Mathematics and English related games, then Elevate games are must for your smartphone. 2. Lumosity Brain Training Games: In case you are interested in action, logical or memory games, then do checkout Lumosity Brain Training games. 3. X-Sums Sudoku Puzzle: In case you are interested in solving printable Sudoku puzzles, then do checkout this very interesting Sudoku variation called X-Sums Sudoku puzzle. 4. Mind Blowing Maths Questions: After all these Sudoku experience, its time to solve some Mind Blowing Question of Mathematics.